Lunches are some of the hardest meals to figure out. Boo still can’t eat and walk at the same time, so snacking all day instead of stopping for lunch is right out. Sometimes we have a hot lunch, sometimes we don’t. What Boo eats varies a lot. 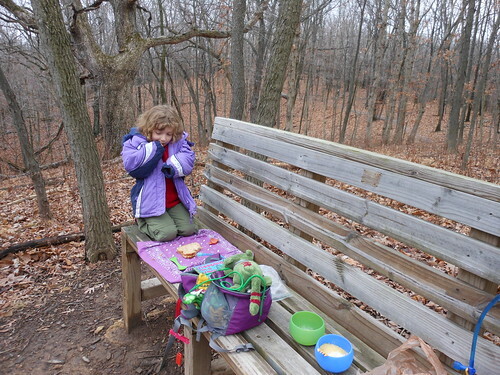 Here are some things she’s eaten for lunch on hikes. She’s been a fan of hard boiled eggs for a while. They’re good to fill her belly and stick with her, and I don’t mind eating her leftovers. 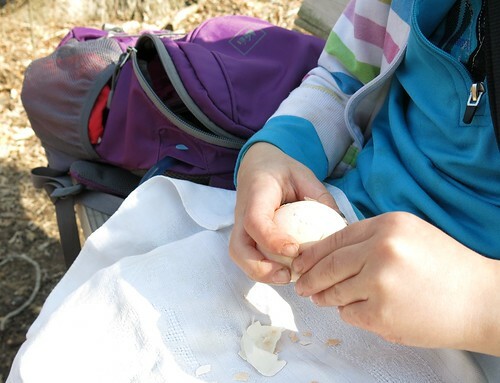 The shell must be carried out, and if she’s already too hungry, there’s no quick sugar boost, but as a planned meal or snack, they’re awesome. Some tortillas, meat, veggies of choice (tomatoes, greens, cucumbers), maybe a mustard packet. Pack the ingredients, build at lunch time. Awesome for unplanned dayhikes that have to start at the grocery store anyway. We often have a pita with a pouch of tuna. We have had dehydrated hummus, which was fine after it sat a few minutes. Much like wraps, almost anything can go into a pita. Sometimes something hot is called for. We’re fond of couscous, and not just because it was the only camping food we knew when we started. I start her portion rehydrating before the water boils, so it’s not too hot for her when it’s ready. One recent hike, Lee made calzones in the morning. We wrapped them in towels in our bags, and they were nicely warm for lunch. A traditional choice. Boo is fond of peanut butter and jelly. 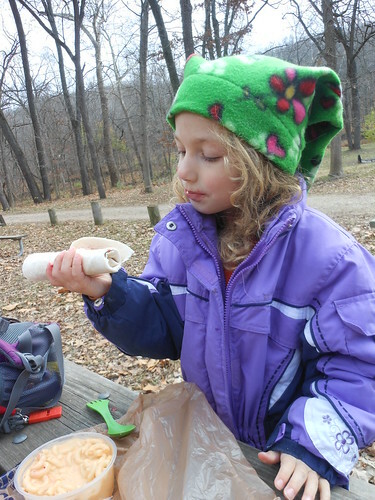 Though we try to keep this to a snack level, there is always the option to eat what plants are edible and allowed. We’ve been known to munch on dandelion greens, garlic mustard, and an assortment of berries. What do your kids eat for lunch? Is it any different than what the adults eat?